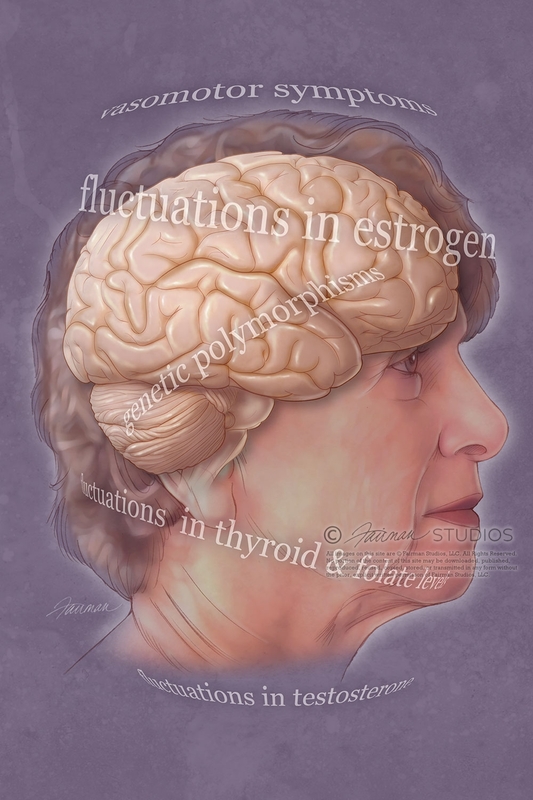 The illustration depicted was created for the April 2013 26(4) issue of JAAPA feature article, Treatment options for major depression during the menopausal (Bobbie Posmontier, PhD, CNM, PMHNP-BC). Compared to men, women experience 1.7 times the prevalence of depression, largely because of fluctuations in reproductive hormones. Even without a prior history of depression, vulnerability to depressive symptoms may be especially increased during the menopausal transition as a result of greater sensitivity to the extreme fluctuating levels of estrogen, other hormonal influences, and single nucleotide polymorphisms that are unique to women. PAs need to understand the varying presentations for women with depression, a major health burden and component of the National Commission on Certification of Physician Assistants Blueprint, and to appreciate the nuances of treatment if underlying hormonal fluctuations are driving symptoms. Emerging science is redefining the initial treatment approaches, and traditional therapies for major depression may be inadequate to control the symptom burden of patients with menopausal depression. The purpose of this article is to aid PAs in understanding the hormonal and genetic influences as well as the symptoms of menopausal transition that overlap with symptoms of major depression and to discuss effective assessment and multidisciplinary management of major depression during perimenopause.